13/9/2017 The first cooperation on Network Security Conformity Assessment between China and German. Sponsored by Certification and Accreditation Administration, German Federal Ministry of Economics and Energy and China Information Security Certification Center, the China – German Symposium on Information Security Assessment was successfully held in Beijing on September 11th, 2017.It is the first time for China and German to start network security conformity assessment cooperation, which attracted more than 200 participants from relevant government departments，testing certification bodies and related enterprises in China and German. 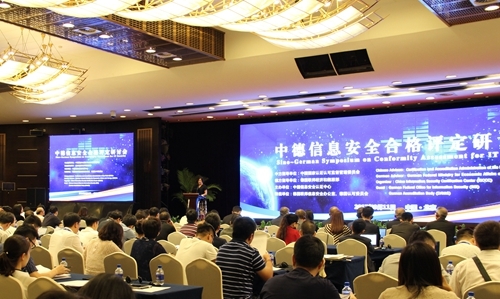 This symposium aims to promote strategic cooperation in “Made in China 2025” and “German industry 4.0”, focusing on the common concerned issues about the network security laws and regulations, standards, testing and certification. In order to facilitate trade development and technical exchanges between the two countries, China and German will share best practices to explore pragmatic cooperation, and enhance the mutual trust in network security certification.